The NGN is a feed-forward back-propagation artificial neural network that classifies formal strings based on a parse tree defined by a formal grammar in Greibach Normal Form. The NGN takes on the structure of a parse tree, such that node layers (activations) are mapped onto language symbols and weight layers are mapped onto the edges that connect these symbols. Because the syntax of the strings to classify (or curve fit) are specified in GNF, it is possible to nest strings within strings to form recursive structures. The activity of syntactic recursion maps thus to a recursive structuring of the NGN. The NGN was originally designed to work with SMILES and InChI to classify and curve-fit bioactive molecules. I’d be very interested if you happened to uncover another problem domain to which the NGN may be amenable. 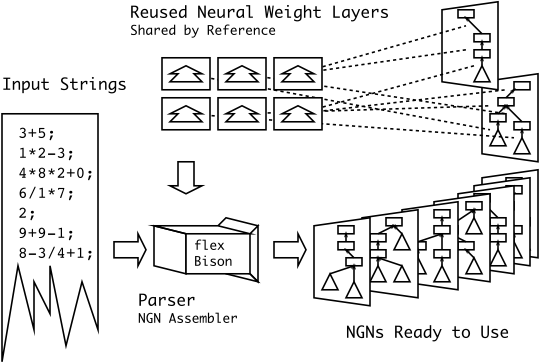 The NGN internally uses flex and Bison to build up the network graph. Weight layers are re-used — this re-use enables the persistant memory between training parses and recognition parses. Warning: This code is very ad hoc as most of it was written while I was learning Python/flex/bison — contact me if there is anything you want explained / rewritten / refactored for your project. (1) What's a Neural Grammar Network (NGN)? be saved and loaded in order to perform training and recognition tasks. recent compatible data was run in 2009; InChI v1.00). This will create a binary 'ngn_generator/inchi/inchi'. Notice that a weights file has been saved as "weights.txt". Notice that the recognition responses are saved as "response.txt". Note that in reality, you'd train on one set of data, then test on another set. information as this process can become involved. tests, and generalization. BMC Bioinformatics 2010, 11(Suppl 8):S4.